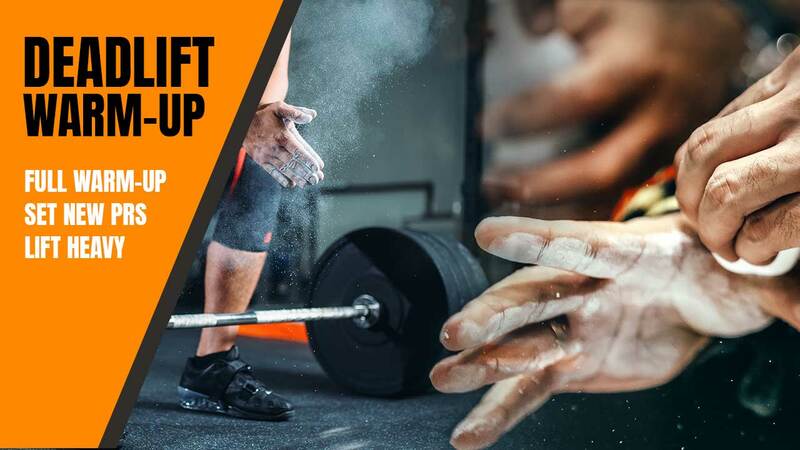 The perfect warm-up for deadlifting heavy or setting deadlift PRs is a warm-up that first focuses on getting the blood pumping through the body. I’m talking ‘sweating warm’ but not exhausted laying on the ground warm. The number of reps and duration will depend on the local conditions and athlete. Only the athlete itself will know what is a good duration or amount of reps through the feeling of being warm, you simply know when you have that warm fuzzy feeling all over. In the first part of the full warm-up, you want to make sure you don’t overtax any of the muscles heavily involved in the deadlift. For example, rowing with heavy resistance would be taxing on the finger flexors which are extremely important to hold on to the bar and pull it. We want to tax the cardiovascular system. You can also mix the exercises to avoid taxing any particular muscle group. Burpees, sprints, skipping, followed by rowing with just enough rest between rounds. Repeat for 3 to 5 times. It really doesn’t stop there, hence, the reason for the deadlift being a full body exercise. Some of the most common muscles forgotten in the warm-up, but so important, are the finger flexors. If your grip is slipping on the bar then your lift will be cut short. When you move into priming of the muscles you want to make sure you do enough but don’t make it too long as you don’t want to lose the effect of the warm-up. Keep moving fast and add additional movement if you feel you’re losing the warmth. Here is a quick example of priming with just focusing on common areas. I wrote x number of times because there is no magic number that works for all, go by feeling. For grip, you can use a tennis ball, the bell of a small classic kettlebell, or if you don’t have any of those you can make a fist and squeeze. Don’t forget the thumbs! Shoulder shrugs are great for the upper trapezius and levator scapulae. Priming these properly will help keep your neck injury free. Shoulder circles and cervical rotation are also great to add. Your lats and other muscles are used to keep the ball of the humerus neatly in its socket and safe, at the same time together with your pectoral and other muscles, they’re also used to create a packed chest/shoulders, i.e. a stable base to pull the arms with. Here is a great movement to prime that area. I mentioned that priming grip is often overlooked, here is another one, the feet! Flexor digitorum longus, flexor digitorum brevis, lumbricals, dorsal interossei, abductor digiti minimi, flexor digiti minimi brevis, quadratus plantae. Your feet are where the lift starts, it’s the base for everything. For good solid stabilization and base, you want to take advantage of maximum coverage, i.e. the more space you cover the better your base. I’m talking about spreading the toes and using them plus the balls of the feet. I like reverse lunges, the Hindu squat, or Curtsy lunges to work on these areas. The part where the ball(s) of the feet remain on the ground and the heel is lifted. The Curtsy is also great to work the smaller gluteal muscles, adductors and abductors etc. The stiff-legged (true) hip hinge is the best for isolation and priming of the gluteus maximus. With the conventional deadlift, the gluteus maximus is one of the prime movers, hence, needing attention. The gluteus maximus and the hamstrings (plus other muscles) pull the pelvis up, on top of that is your spine which should just be a rigid structure moving along on top of the pelvis. The Hindu squat is great for the balls of the feet, the calves, and the quads, it does not tax the core muscles. Which brings me to the abdominals and other muscles around the spine for stabilization like the multifidus around the vertebral column. To name the list of muscles in the erector spinae would nearly take up this whole page and really not add any benefit, but you should know that the erector spinae is not just one muscle but a name for many muscle groups that erect the spine. With all that said, it’s time to prime that area. These videos are part of the Caveman Mobility Program, also available on Amazon. Start getting creative with the warm-ups and use some of the movements discussed later in this article during the rest periods in the initial warm-ups. After you’ve completed your warm-up for the deadlift you want to work on the deadlift movement and get a light bar with just 20% to 30% of your 1RM. If you’re seriously warm you can pull heavy right away to use all your strength and focus on getting that PR. If you feel you’re not warm (haven’t done your warm-up correctly) then gradually increase with enough rest (2 to 3 reps) but making sure you’re not wasting the energy that you should save to hit that PR! Note: The deadlift referred to in this warm-up is the conventional deadlift, the hip hinge deadlift, but the warm-up is just as good for the squat style deadlift (think more CrossFit style deadlifting or the sumo deadlift). With the sumo deadlift, you’d want to look more at the adductors and abductors. The deadlift is a posterior workout so make sure you stretch those muscles after your work. Here is one of the best stretches you can do for the anterior, and yes, you should focus on the whole body when it comes to stretching.